SEATTLE, WA. 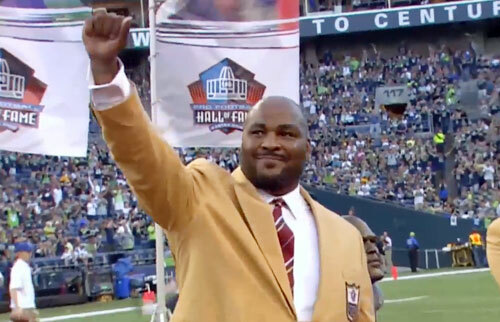 — On Sunday Nov. 2, 2014, Pro Football Hall of Famer, Walter Jones, became the 11th member of the Seahawks’ Ring of Honor during the halftime ceremony of the team’s game against the Oakland Raiders at CenturyLink Field. Jones becomes the 11th member of the Ring of Honor, joining Steve Largent (1989), Jim Zorn (1991), Dave Brown (1992), Pete Gross (1992), Curt Warner (1994), Jacob Green (1995), Kenny Easley (2002), Dave Krieg (2004), Chuck Knox (2005) and Kennedy (2006). Source: Clare Farnsworth, Seahawks.com. 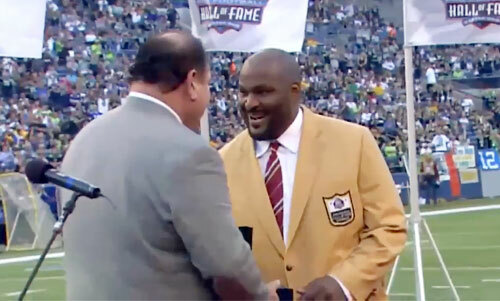 Photo shows Walter Jones being congratulated by David Baker president and executive director of the Pro Football Hall of Fame after becoming the 11th member of the Seahawks’ Ring of Honor. In 5,703 pass plays during his career, Jones allowed 23 sacks or one every 248 pass plays. In 12 seasons, which included 180 starts, he was penalized for holding nine times. Photo shows Walter Jones being cheered by fans after receiving his Seahawks Ring of Honor on Nov. 2, 2014 during the halftime ceremony of the team’s game against the Raiders at CenturyLink Field. Jones was that good. A club-record nine-time Pro Bowl selection, a franchise-high six All-Pro selections, a first-ballot Pro Football Hall of Fame selection who already has had his number retired. And now, a member of the Ring of Honor. All that goodness from one of the greatest players in franchise history, and the greatest left tackle in the history of the game. And Jones did it all one block at a time, in all seasons and for all reasons. Jones spent 13 years with the Seahawks, from 1997 through 2009. He started 180 games during his career with the team, and he made it to the Hall of Fame on the first ballot.